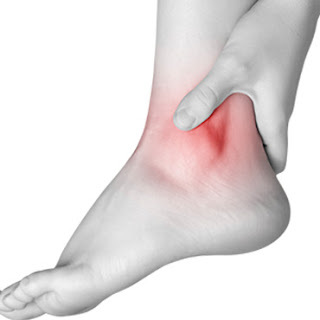 Ø Ankle pain is often due to an ankle sprain. Ø An ankle sprain is an injury to the ligaments, which connect bones to one another. Ø In most cases, the ankle is twisted inward, causing small tears in the ligaments. The tearing leads to swelling and bruising, making it difficult to bear weight on the joint. ü Rest your ankle for several days. Try NOT to put much weight on your ankle. ü Put on an ACE bandage. You also can buy a brace that supports your ankle. ü Keep your foot raised above the level of your heart. When you are sitting or sleeping, place two pillows under your ankle. ü Ice the area right away. Apply ice for 10-15 minutes every hour for the first day. Then, apply ice every 3-4 hours for 2 more days. The injury may take a few weeks to many months to fully heal. Once the pain and swelling are mostly gone, the injured ankle will still be a little weaker and less stable than the uninjured ankle. Ø Lose weight if you are overweight. Extra pounds put strain on your ankles. Ø Warm up before exercising. Stretch the muscles and tendons that support the ankle. Ø Avoid sports and activities for which you are not properly conditioned. Ø Make sure that shoes fit you properly. Avoid high-heeled shoes. Ø If you are prone to ankle pain or twisting your ankle during certain activities, use ankle support braces. These include air casts, ACE bandages, or lace-up ankle supports. Ø Work on your balance and do agility exercises. Symptomatic Homeopathy medicines help for Ankle Pain, so it’s good to consult an experienced Homeopathy physician without any hesitation.